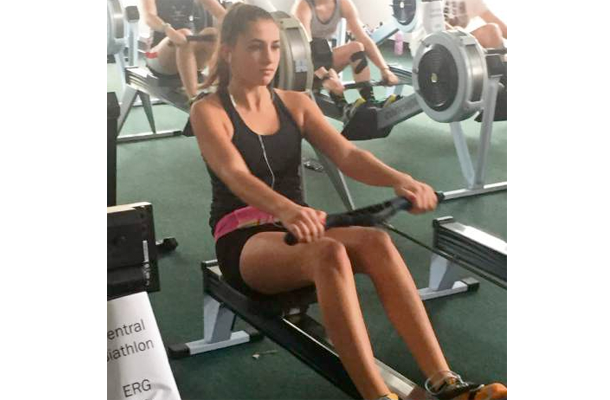 Friday, Dec. 18, 2015, 7:42 p.m.
Just weeks after taking up rowing, Fox Chapel freshman Leah Fetting took first place in the high school novice girls event at the Central Catholic Biathlon at the Three Rivers Rowing Association on Washington’s Landing Dec. 12. Fetting, one of 36 competitors, completed 5,000 meters on an ergometer in 24 minutes, 5 seconds and a 6-mile run in 53:14. Her total time of 1 hour, 17.18 seconds was 20 seconds ahead of teammate Diana Crookston, who was second in 1:17:38. Mark Bellinger, head coach of the Fox Chapel Crew, said Fetting was determined to compete. “She has never rowed before and seemed a bit nervous about catching up with the other novice girls,” Bellinger said. “Over the past week, she made tremendous strides on the erg.